I love that they start by saying “If you’ve ever visited a certain, large, Swedish, rat-maze-like furniture store”…. Gee I wonder if they mean IKEA LOL 😀 I did adapt it slightly, but the final product is REALLY similar and VERY tasty! Combine ground beef, breadcrumbs, milk, seasonings, salt and pepper. Form ping pong sized meatballs, about 24 of them. Arrange meatballs in a couple layers in large slow cooker. Whisk together the consomme’, flour, Worcestershire sauce, vinegar and house seasoning. Pour this over the meatballs evenly. Cook on low 6-8 hours or high 3-4 hours until meatballs are cooked through, but still tender. Using a slotted spoon remove meatballs to serving platter. Skin any fat from the gravy. Add sour cream to a small bowl. Add sour cream mixture into gravy, whisking to combine. 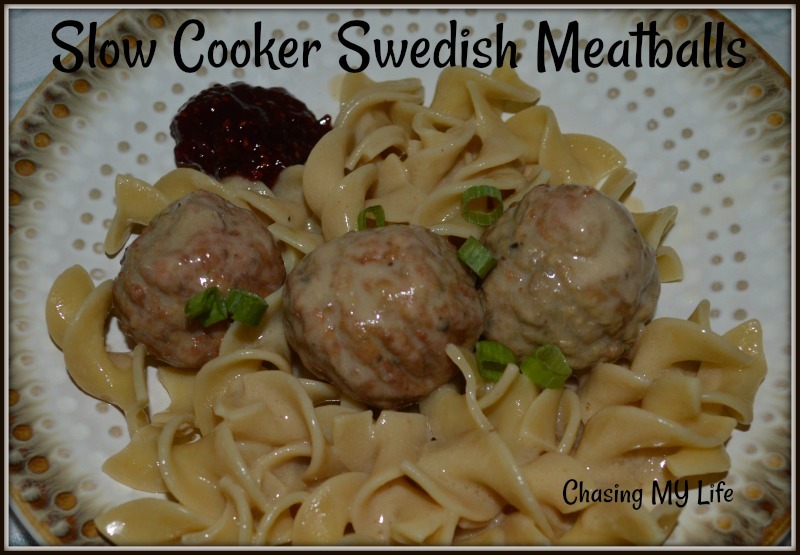 Add meatballs back into slow cooker and cook 30 minutes more. Serve over prepared egg noodles with lingonberry jam.